I prided myself in being able to say that I never locked my bicycle in Siem Reap for two years and never had a problem. I’ve left it outside on the busy streets of the Old Market almost every day while I bought groceries and outside restaurants. One time when my friend and I decided to go dancing late, I left my bike unlocked next to her scooter until 3 a.m. I thought for sure it would be stolen. We walked back to our bikes and they were both there and the last ones left in the pitch dark. I knew of course if it ever got stolen, it would be my own fault it was my risk. In Vancouver, bikes get stolen within seconds I would never think twice about leaving it unlocked unless I was in a farming community. I was playing at my weekly football game at Goal Academy and as usual, I did not lock my bicycle in the parking lot among many bikes and scooters. After the game, I went out and couldn’t find my bicycle after looking around the whole lot. Some people thought someone might have accidentally taken mine by mistake. Of course when someone takes your bike, it’s long gone and I can’t imagine trying to attempt to find it. 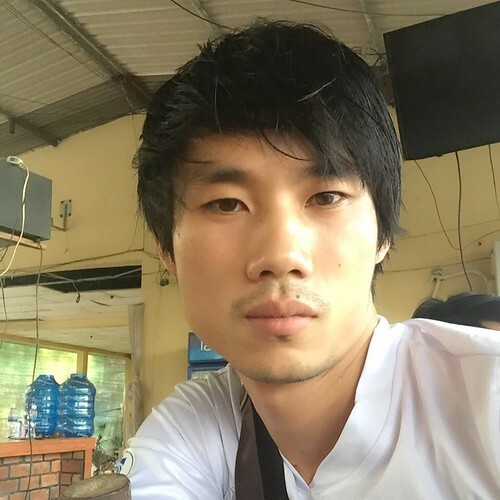 Chan, the owner of the small bar and the football field, surprisingly had a video camera tied to his phone and he played back the time I arrived and monitored to see who took my bike. I left Chan my phone number in case anything turned up, but I was doubtful. So I thanked him for his time and started making arrangements to buy another street bicycle. When I went back to his bar, he wheeled out my bicycle and asked him again how the hell he found it. He said, “After you left, I spent three hours looking for your bike. I would have felt so guilty if it got taken on my property. 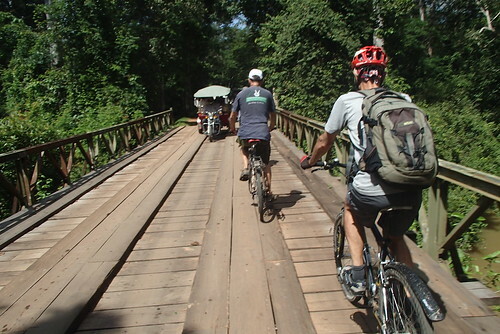 We were told we would cross six bridges along our ride back into town. 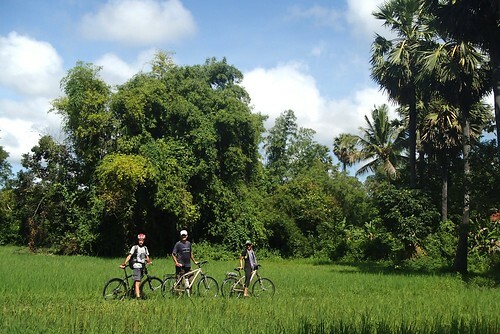 My friend and I had an incredible time in Battambang, Cambodia, about 167 km from Siem Reap City. We decided to take a weekend to motto there and back. I’ve been to Battambang twice to ride the bamboo train on a group trip and saw some of the surrounding mountains. But I had no idea there was kayaking. Battambang is a really nice chill town with amazing food and not an excessive amount of tourists. This is the sign to look for on the road to Phnom Banan when you check in at their office. My friend told me about this social enterprise Green Orange Kayaks, which is run by an NGO that provides free English classes to children in the community. 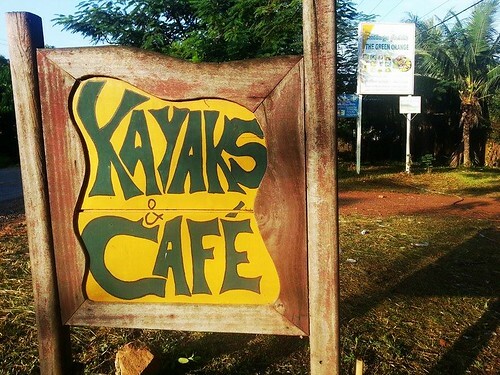 Visitors should know they also have guesthouses by the river and the money goes to the program as well. 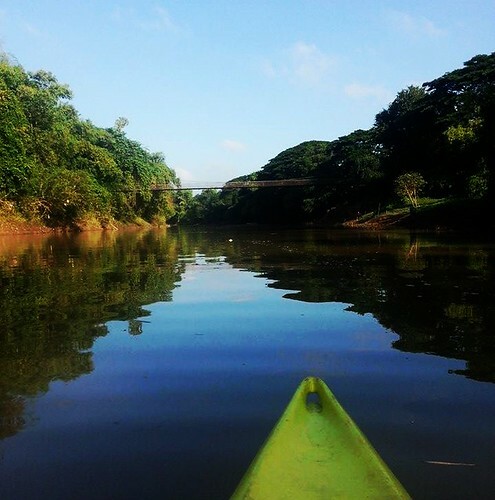 For US $12, you could rent a kayak for one to three people and take as long as you’d like to go down the beautiful river for 8 km. When we called the organization, even through their office was closed, the employees met us on time on a Sunday morning and led us to the river. The usual friendly Cambodian smiles. Because we had to leave by lunchtime in the afternoon, they were nice to suggest that they could drive our motto into town so that we wouldn’t have to kayak the 8 km back, which saved us time. Giving your motto keys to someone you just met would be unimaginable in so many country but in Cambodia, I wasn’t worried at all. 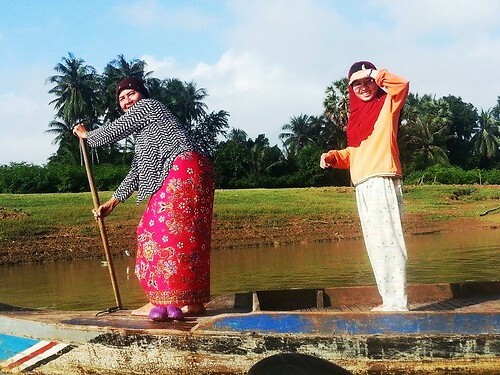 Not only was the landscape beautiful, I was very surprised that the community was Muslim as many of the Cambodians along our route were wearing hijabs, a veil that covers the woman’s head and chest. 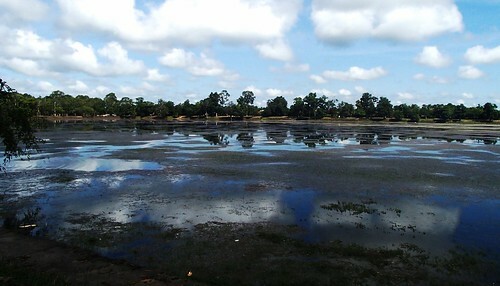 Only about 1.6% of the population in Cambodia is Muslim, so that’s why it was interesting that they live along the river. The first of six bridges we were going to cross. We unfortunately didn’t have time to stop by the villages along the way. 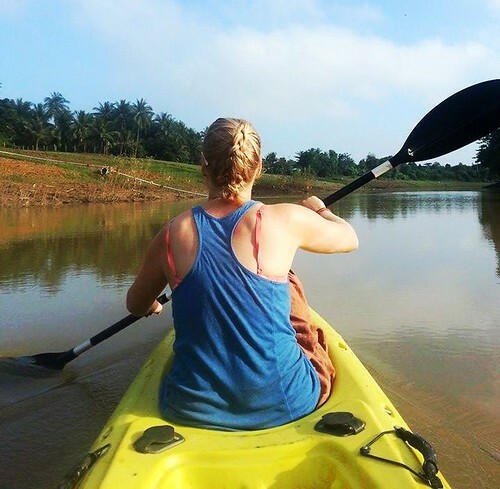 Next time I visit Battambang, I’d like to take a full day on the kayaks and stop along the communities and eat lunch at the local restaurant. If you have a full day, definitely take the time to enjoy your ride and interact with the people in the area. Call +855 17 736166 to make an appointment. Most people hire a tuk tuk but if you also have a motto, it’s a beautiful ride there! 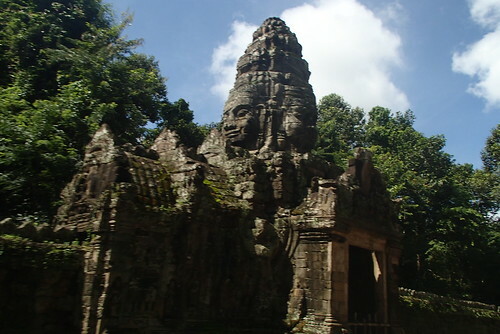 It’s on the same road to Phnom Banan, which we also didn’t have time to see but definitely worth another trip. Our wonderful guides who made sure we got safely down the river. And yes, we got our motto back. My friend’s sister and her adorable daughter in Banteay Meanchey province, Cambodia. I’ve been fortunate to grow up in Vancouver, Canada where, for the most part, I haven’t felt deprived of opportunities because I’m a woman. Yes of course there is still discrimination on Canada in terms of pay and I have been underestimated at times because I’m a girl. I always believed in women’s rights to choose any career they want, have the freedom to live a lifestyle they choose, study whatever they’d like and have the choice to not get married or have kids if they so please. And after living in Asia for a year and being in my home island-country Mauritius in Southeast Africa, I have never felt more passionately about empowering women and wanting every woman to have equal rights to men around the world. After spending time in cities and remote villages in Laos and Cambodia, my blood boils when I see and hear so many stories of women who have no say when they get married, particularly when they are only 13 to 20 years old. 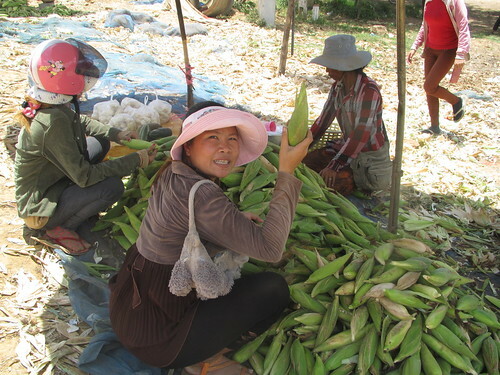 In Laos, women often stop their schooling once they are married and have no say in their marriage or lives. They are slaves to the country’s customs. I’m very happy that she has been sporting her bike the past year. When people like her start to willingly dismiss old mentalities, this is where change happens. Communities would absolutely crumble without all of the work women do for the house, children and their families. They give so selflessly, whether it’s voluntary or not, and expect very little in return. And what’s sad, however, is often women themselves pass on these old customs to their children and the cycle of inequality continues. The women demand so little of their husbands to help around the house instead of spending most of their time drinking, smoking and waiting to be served. However, it’s interesting being in Siem Reap and seeing what’s happening in Cambodia with this next generation. Some of my female friends are incredibly driven and value education and they will pass that on to their own children. This is where change happens. I’m not trying to sound like a man-hater because I’m not. I have been so grateful to meet the unique, unfortunately, a minority of men, who do domestic work, cook for their families and take good care of their kids. I’ve met many genuine and gentle men who have such great characters and are great models for how men should be and act around women. So my wish for women and men around the world is that they are able to go to school, determine their own destiny, stand up freely against injustice and be able to choose the life they want to live. While my friend was visiting Laos recently, she kindly bought this necklace for me. 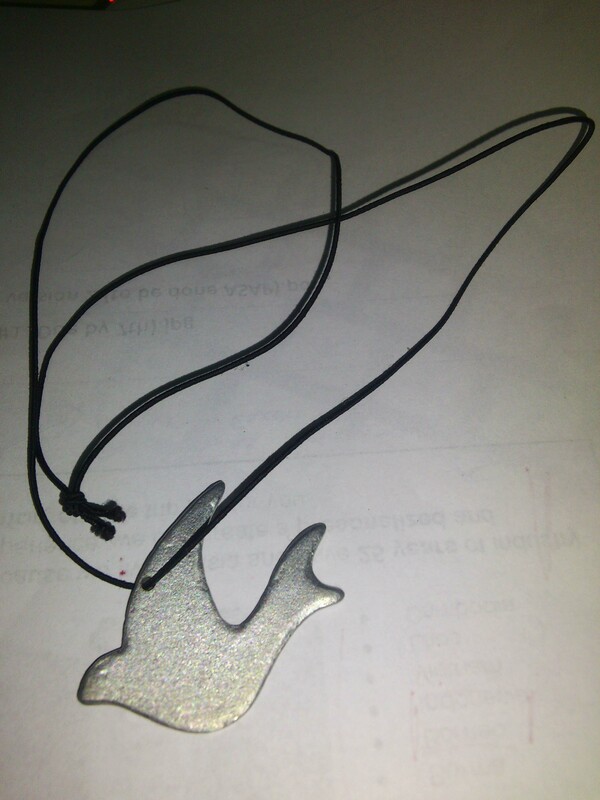 I loved the design and I didn’t immediately realized the inspiring story behind this beautifully crafted jewelry in the shape of a dove. 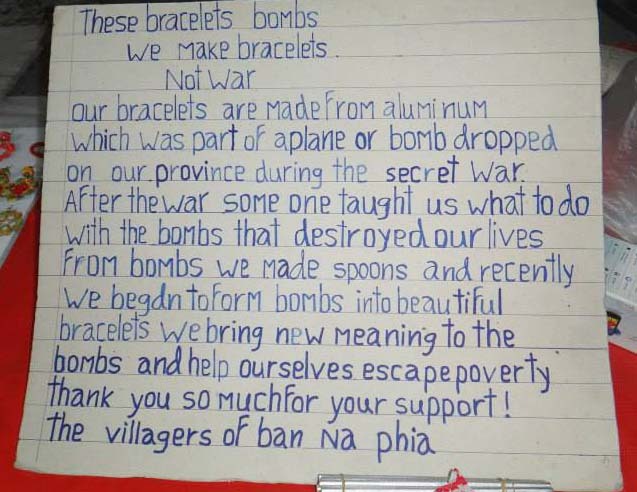 People who reside in Ban Na Phia village were taught how to use the very bombs that destroyed their lives during war into spoons and bracelets. Their crafts generate income and transform what used to be a deadly weapon into a symbol of peace. 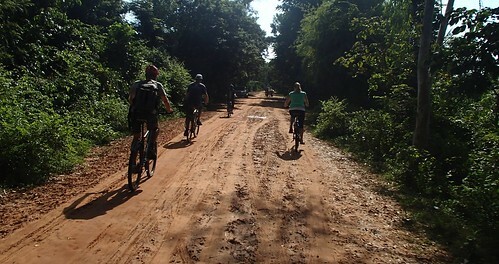 I love joining the weekly bike rides in Siem Reap. Every Saturday morning at 8:00 a.m., anyone can join the group in front of the Grasshopper Adventure‘s office close to river and across Peace Cafe. Different people take turns leading the ride, which usually lasts between two to three hours depending how far people go. Whether 2 or 20 people join, the group goes rain or shine. 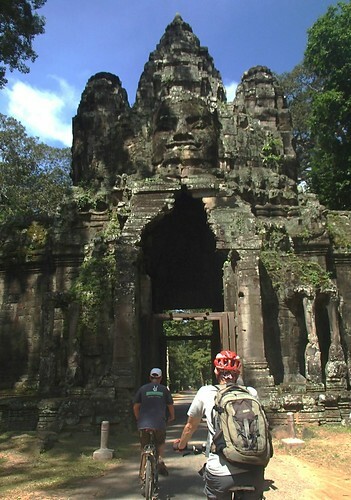 Going along the walls of the Angkor Wat area is one of my favourite routes and we did just that last weekend. 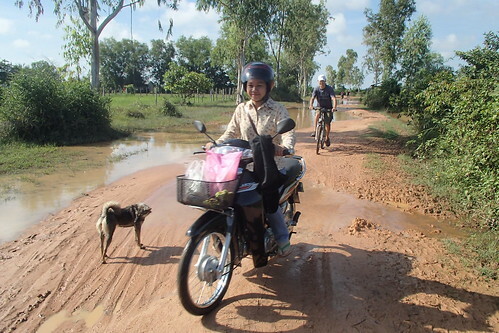 During the rainy season from May to November, sometimes we go on some pretty muddy treks and have to carry our bicycles across the water. But that’s all part of the adventure. The cheapest places I’ve found for a mountain bike rental for a whole day is $3 US at a bike shop on Sivatha Road within a block of X bar on the same side towards the direction of the roundabout. To avoid handing my passport, I just tell them that my passport is in Phnom Penh on a Visa extension. But they’re trustworthy, I wouldn’t worry about scams at this shop. 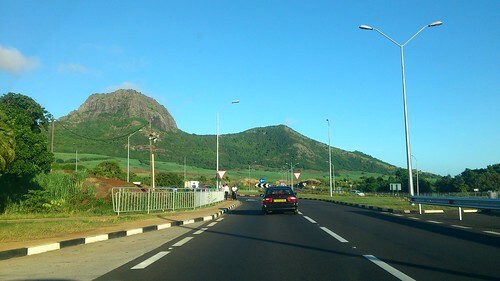 Mauritius is changing at a faster pace with new malls (not my preference) and this newly built highway. As of today I’m changing the name of my blog to “Live and love life from “1.5 years exploring Asia and the return to Delicious Mauritius.” I have officially completed my 1.5 years of volunteering and exploring Southeast Asia and visiting family in Mauritius, a small island-country oh the southeast coast of Africa where I was born. But my journey is nowhere near over. While I was in Mauritius I had my little freak out and I wasn’t ready to go back to Vancouver yet. I almost said, “Go back home” but now I feel like I have another home and that’s in Siem Reap, Cambodia. Many travelers I’ve met found new homes in other countries and have also had a hard time returning to their home countries. I met a friend randomly at a community event and she took me to her hometown in Banteay Meanchey, 2 hours away from Siem Reap, to meet her family for a few days. While my parents are still healthy, I told myself in Mauritius, “I’ll apply for a few jobs that look really interesting in Cambodia. If I don’t get any of the jobs, it’s not meant to be and I’ll get work in Vancouver.” I thought my chances would be relatively low because even if I got an offer, I’d have to wait almost two months to start because I was going to Vancouver to see my family and friends. After two hours and applying to three positions, I got a reply from one of the jobs the next day to arrange a Skype interview. After a good conversation, I ended up getting a position as a marketing executive for a travel company. I’m very happy to be going back to Siem Reap for a little bit longer and where life goes from there is uncertain but that’s ok and being open is half of the fun. A few of my good friends now are applying for positions outside of Vancouver because the world has many more possible paths than the place we grew up. Follow your heart and discover your passions. Joseph and I took a detour from the coastal road on the beach to avoid riding up a mega hill. During the five months I was in my home island-country of Mauritius in Africa, I was incredibly lucky to find out that my cousin Joseph likes adventurous activities. 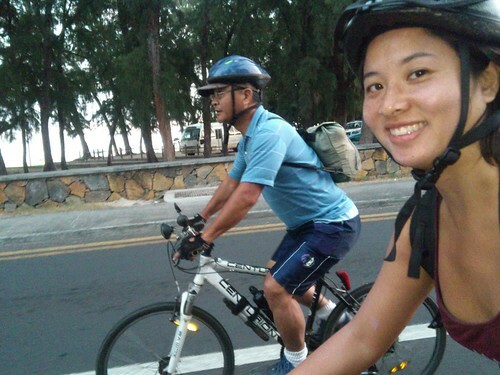 Out of the 300+ members in our family, he is the only one who likes to ride bicycles and do long hikes. When I say ride bicycles, I don’t just mean leisurely rides through open farms and fields. I mean riding on the roads, through the forest and new routes he’s never been on before. Since I found out he liked biking, we have been going on bike rides almost every week. He bikes every day to work and back a huge hill that takes 10 minutes to go up, so his stamina is incredible and a hell of a lot better than mine! The beautiful waters in northern Mauritius. During our first ride together, we did 70 km ride and a huge climb on a big hill. 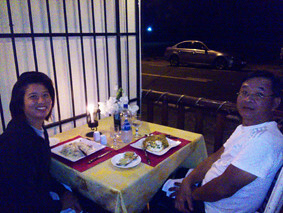 Two weeks later, while we were doing a leisurely ride on the south coast and while we were starting to pack our bikes, Joseph said, “I’ve always wanted to do the tour of Mauritius.” I excitedly replied and said, “If I had known you earlier, I was looking for someone or a group of people to do the tour of Mauritius for my birth as a fundraiser bike ride! If you have time next week, let’s do it before I leave the country.” He immediately said yes and believed we could do it in two days. We decided to do the ride just five days before we actually began. 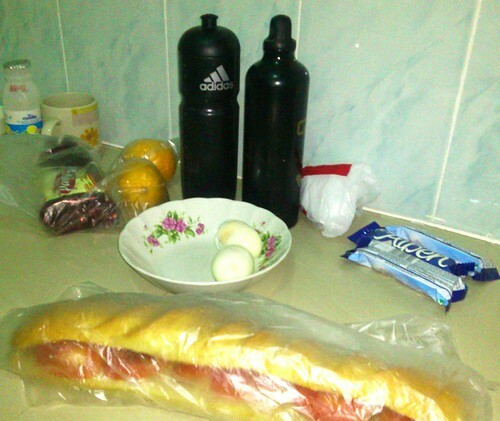 Joseph prepped our 5:30 a.m. breakfast ingredients so we would be well fueled on day one of two of our 360 km bike ride. 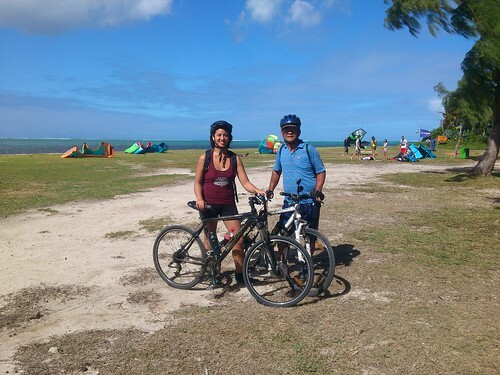 Our goal was to cycle 360 km along the coastal roads of Mauritius in two days. Joseph was awesome and planned all of our break stops to make sure we were on track and where we should be every hour. The man on the right was nice enough to stop, lend us a screwdriver to change a flat tire and wait patiently until we were done before he continued on his way. Unfortunately crime has gone up the past decade in Mauritius and many people I know on the island are fearful at times to the point where they don’t really trust many people. Their fear infected me for the first two weeks to the point where I was suspicious of people’s genuinely kind gestures like when I was lost sometimes and they walked with me to show me where I needed to go. But over the five months I was in Mauritius, the people I didn’t know kept being kind to me the way other local people were in every country I’ve been in. I know there are a lot of people in Mauritius you can’t trust and people get screwed over a lot by their own friends. 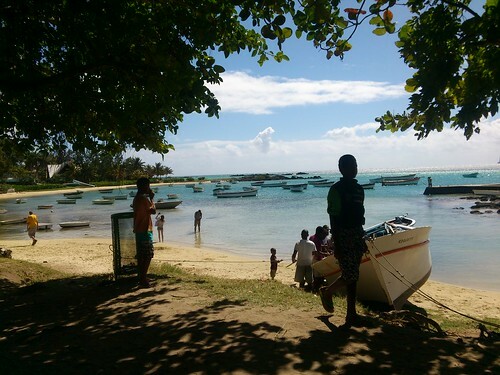 But I seem to attract positive people so instead of just looking at the negative sides, I didn’t let excessive fears shield me from experiencing the kindness of helpful Mauritians. 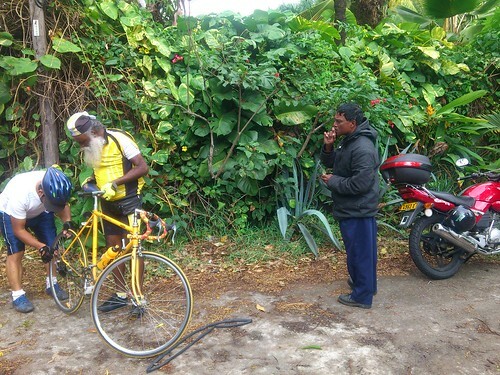 Many of my relatives were worried about us riding around the island but Joseph and I both know there are kind people along the way and weren’t worried about being attacked in any way. On the contrary, the people in the smaller villages we rode through are very kind, honest and it felt much safer than being in the cities. We road along the windy south part of the island that slowed our pace, but we kept pushing on. Joseph’s friend joined us for the first few hours of our ride and had to go back to his home for a meeting. He unfortunately had a flat tire in the first two hours we were riding and Joseph had most of the tools except for a screwdriver. So Joseph stopped a motorcycle that was passing by and the driver was so nice to stop, lend us the tool we needed and waited patiently. Whenever we’ve cycled in the past, I feel a warmness among people in the villages. When we stopped at a woman’s restaurant, people brought our food with smiles and kindly set up the tables for us. 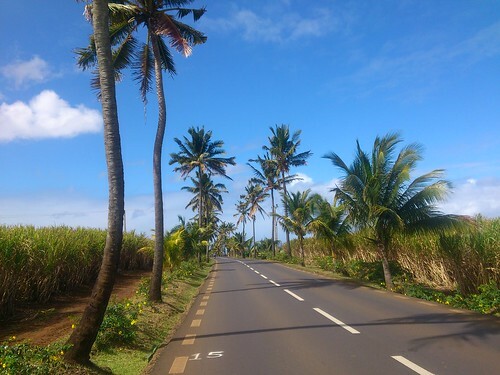 These are the tallest coconut trees I saw during our ride. I know this sounds really cheesy but it’s true. We could have the best bikes, all the food we need and all the tools. But all of that wouldn’t have mattered if we didn’t have the strong belief that we could meet our goal throughout our trip, even when we had delays or when I was extremely exhausted. I’m not nearly as fit as Joseph and we took so many breaks because I had to stop a lot, especially after some longer hills. But Joseph’s constant positive energy throughout our whole trip played a huge factor in us being able to meet our goal. He never once complained anytime we had a flat tire, took the wrong route or bad weather conditions. 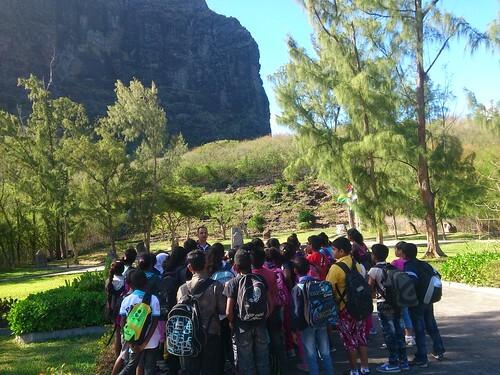 As we stopped at Le Morne mountain where we saw a group of kids learning about the runaway slaves who used the mountain as a shelter through the 18th and early years of the 19th centuries. They formed settlements in the cave. On the second day, we started riding when my body felt like it was at 60% energy than normal after riding for 11 hours of riding the day before. But after awhile, my body just kept going on for some time and it’s fascinating how much our bodies can push on after it hits a certain point. People talk a lot about this physical and mental point when they run and they can just keep going for a long time. It’s easy to get in a reflective state when you’re bicycling when you hear nothing but the sound of wind, your pedals in rotation, and complete silence. 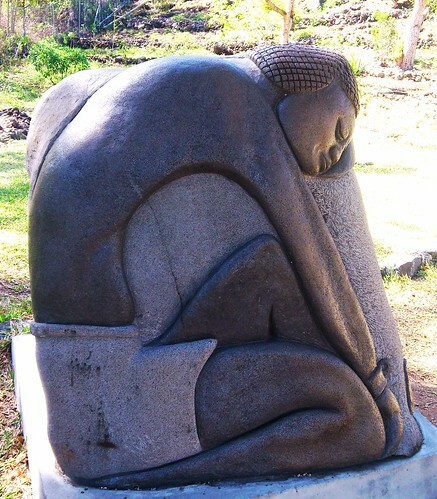 This is one of several sculptures that are displayed at the base of Le Morne. My biggest personal challenge was at the end of the first day when we had to cycle another 2 hours than we had originally planned and rode over a continuous hill in an area called Albion. I haven’t pushed my body that far since I did a 500 km bike ride across Cambodia in 2009. Joseph didn’t look annoyed. Instead he was extremely encouraging and said, “We’ll stop here, I’ll get you a soft drink. Right now you just need energy. You didn’t finish your whole plate of noodles, but I did so you just need energy. I am confident you can do it.” After I drank the soft drink I did surprisingly have a lot more energy than I did five minutes earlier when my body was going to crash. Joseph had a lot of breaks because he would always wait for me a the top of the hill until I caught up. But never looked irritated and he always pushed me at the perfect time. After I had my minute-long breaks, he said, “Ok, ready to go?” He was never overly pushy at all but he made sure we both kept up the pace with enough breaks. We pushed on slowly but surely and I was surprised how revived I felt. We were finally rewarded with a 3 km ride downhill, which was an amazing way to end the day. One the second day we already had a two-hour delay in the first of our eight legs that we had to finish. Joseph was worried, but I said, “No worries we’ll be able to make it, we’re keeping a great pace.” We would have made it only if there were no other major delays like a flat tire. So it was my turn the second day to keep positive energy so throughout the two days we complemented teach other very well. Our Tour of Mauritius reminded me of when I traveled and you just have to have good faith and an open mind to be prepared for setbacks. But don’t expect them to happen then you may subconsciously create that future. Positive energy and encouragement will make you realize your potential. You can see obstacles as a barrier to your goal or as something you are determined to overcome so you become stronger. I couldn’t believe Joseph slept at 10:00 p.m. after riding 11 hours and got up at 4:30 a.m. the next day. Because he was up, he prepared our breakfast, teas and snacks for the day for both of us while I was trying to squeeze in every minute of sleep I could get. Lazy. Joseph made sure that we both ate well throughout the ride and had a good breakfast and lunch. When we ride, we don’t get that hungry often, but of course we needed energy so he made sure we ate something small every hour like a chocolate bar. After my exhaustion peaks on the first day, even though I don’t usually like soft drinks, I made sure I drank one every two hours just to keep my energy up. After a two-hour delay on our first of eight legs on day two, we finally arrived at the beach so we could walk three kilometers to get to the coastal road in order to avoid a huge hill climb. Travelers and people who live on few resources tend to be more creative and are often in situations where they have to find creative solutions to their problems. Many of my Cambodian friends are street smart. They don’t have big U-Hauls like we do in North America so they know how to use ropes and layer everything on a big wooden wagon to be able to transport the same amount of stuff. When my motto broke down, I was going to push the bike to the mechanic but my friend told me to just sit on my bike and he pulled me with one hand while he rode his motto. When you’re traveling, you have to find out how to get around without speaking the local language or finding things you need. 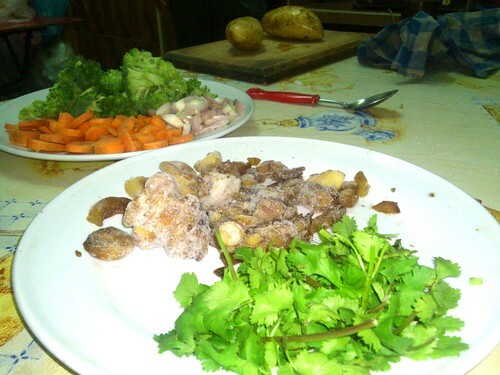 You learn to use images to communicate or make friends with locals who can take to where you need to go. 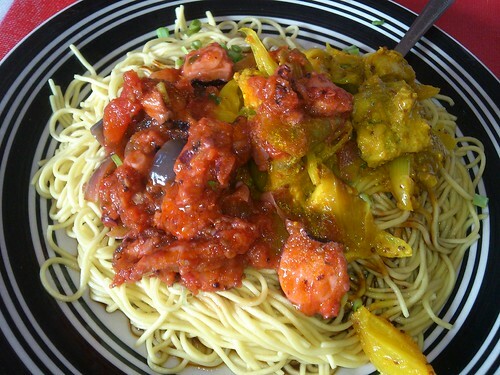 This was our lunch on our first day: octopus and fish curry on noodles. I was only able to eat half of the plate, which quite possibly contributed to my near downfall on the huge hill we had to climb on the end of the day. I should have eaten the whole plate for energy. It appears as though people in Westernized cultures have forgotten how to talk to each other or seem extremely hesitant to talk to someone they don’t know. Joseph and I very similar in that we just ask for directions and are never afraid of getting lost whereas many people would freak out at the thought of being lost. On our second day of the ride, we missed the dirt road on the map that was supposed to take us to the main road so we wouldn’t have to climb the big hill. Our backup plan was to get to the beach through the hotel and walk to the main road, but that didn’t work out because there were renovations and the whole beach was fenced off. Stuffing ourselves with an Italian dinner after 11 hours of cycling on day one. So finally Joseph asked a security guard to give us permission to get to the beach through the hotel because by that point, we were already two hours behind and with any more delays, we wouldn’t have made it to the end on time. 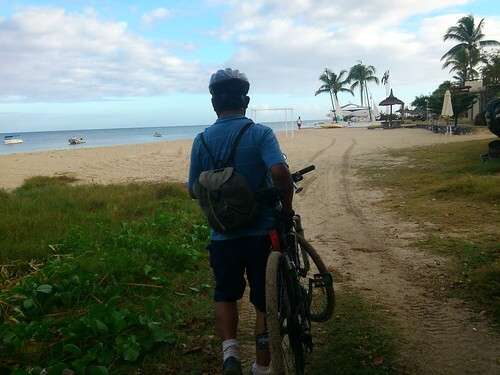 The guard happened to do the Tour of Mauritius by bicycle himself and he said, “I can’t let you in but there is a small path that will lead to the beach just up ahead if you go through the trees.” We we went and made our little trek with our bikes until we made it to the beach. Joseph said, “Even if we don’t make it by 5:00 p.m. we will keep riding until we finish. It’s not good if came all this way not to make it to the end.” His friends were taking his car down and were going to accompany us through the last part of the ride. 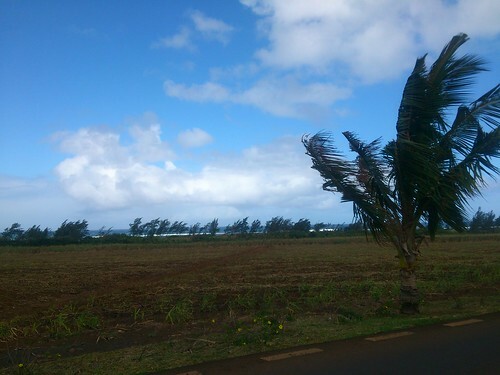 The winds blowing hard at the trees in southern Mauritius. Joseph has been cycling a long time and on a daily basis so he knows what technique is best to reserve his energy. Sometimes I would stand up on my bike for the harder hills or not pedal for a few seconds and just let the bike to go reserve my energy. 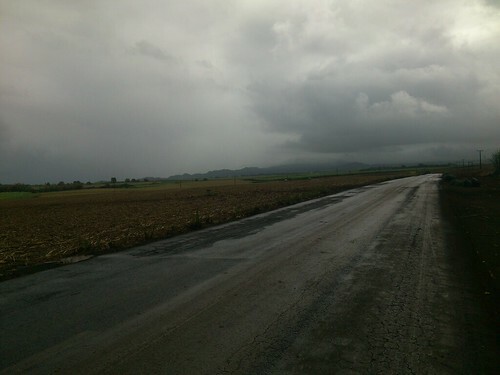 We encountered almost all weathers during the two days: rain, wind and sun. If there was snow, that would be a first in Mauritius. We were on the 12th hour of our ride and for some reason I got a burst of energy and could keep going, even up the hills. Joseph’s friends who we went hiking with in the past followed us in the truck for the last few kilometers of our tour. It was nice to have the support of his friends of what we were doing because many other people just think we’re crazy. 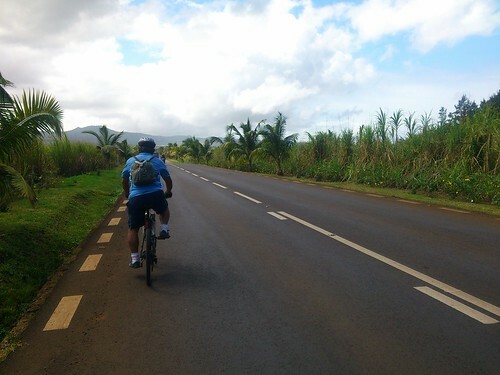 When we finally did it, I got so much in a present state that even when we finished the ride it didn’t really hit me that we cycled around all of Mauritius and I was still very much in the moment. A few times in the ride I asked myself, “Why do you put your body through this torture every now and then when you could be very comfortable exercising at home or a more leisurely bike.” For me, it comes down to discovering my potential and personal satisfaction. 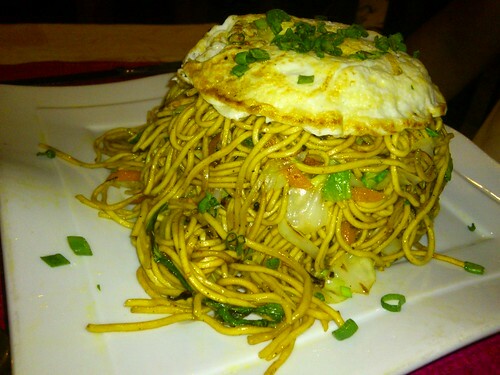 This is the first time I’ve ever seen fried noodles presented like this. This was Joseph’s dinner on the first day of our tour. 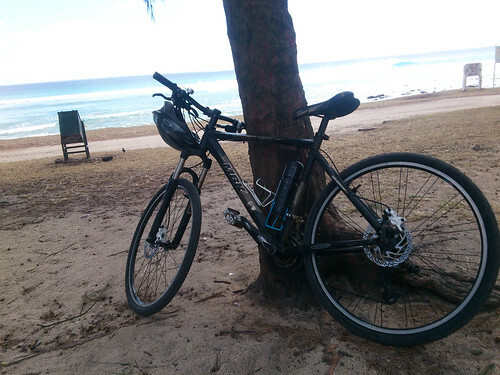 Joseph’s next ambitious goal is to do the Tour of Mauritius in one day! But I believe with his stamina he could do it. While we were riding he had already planned out how many kilometers he would need to cover in an hour in his head and said that he could do it in 13 hours. So go out and discover your potential.